Carlo Ludovico Bragaglia’s fourth and final film of 1958 was La spada e la croce, which also marked a return to the kind of historical adventures that he’d had some success with earlier in his career (Il falco rosso (49), A fil di spada (52), Il falco d’oro (55)). Made for Ottavio Poggi’s Liber Film, who would also go on to finance Edgar Ulmer’s Annibale (59) – which Bragaglia was sometimes also credited with – this would seem to have had a decent budget. There are a couple of biggish stars in Yvonne De Carlo and Jorge Mistral, and the production values are decent enough. Unfortunately, though, it’s a rather flat affair and, although not badly made, it suffers in comparison with some of the more vibrant, modern films in the same general field that were being made in Italy at the time. When Centurion Gaius Marcellus (Jorge Mistral) arrives in the occupied territory of Judea, he has little idea what to expect. The whole area is in turmoil, with the people showing little appreciating for the Roman occupation. The governor, Pontius Pilate (Philippe Hersent), is at a loss how to bring the assorted members of the royal family – let alone the general population – under any kind of control. Furthermore, the Romans are being caused serious trouble by a character called Barabbas (Andrea Aureli), a self proclaimed freedom fighter who has been nabbing all the Roman taxes, despite knowing full well that it will mean that the people will simply have to pay them yet again. Charged with helping Pilate establish some kind of authority, Gaius decides to strike swiftly, attacking the bandits’ camp in an attempt to capture and imprison them all. 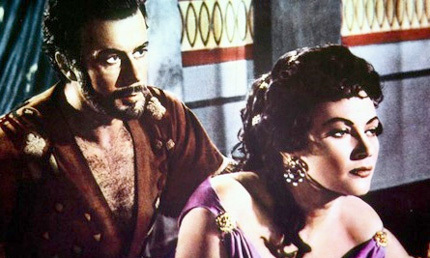 Although Barabbas manages to escape, they are able to rescue Mary Magdelena (Yvonne De Carlo), who had previously been being held hostage by the bandits, and the two of them promptly fall in love. Which is unfortunate, because she’s actually the courtesan of Anan (Massimo Serato), who also just happens to be an old friend of Gaius’s from a previous spell in Judea. Anan, though, has gone bad, and he’s really working with Barabbas in order to fill his own pockets. It doesn’t take long for Gaius to realise that something dodgy is afoot, and he’s hardly any more impressed when he realises the debauched lifestyle that Mary and Anan have been living. In the meantime, though, the whole country has been gripped by a new movement: a radical, pacifist religion led by a guy with a heavily reverberated voice called Jesus. This is an early example of a sub-genre of peplums that could be referred to as ‘biblical adaptations’. Although many peplums featured Christian characters, they rarely linked them up with characters or stories from the bible, more often showing Christianity as an entirely benevolent movement which happens to have an impact on the protagonists’ stories. The Sword and the Cross, though, actually features characters familiar from the bible – Lazarus, Judas, Mary Magdalene, Pontius Pilate – and actually recreates famous incidents from the latter stages of Jesus’ life. It’s actually a rather strange concoction, because for the first half the story is more indebted to Quo Vadis, with the relationship between Mary and Marcus taking centre stage while Anan and Barabbas skulk around being villainous in the background. The second half, though, becomes an almost straight adaptation of the bible, almost totally ignoring much of the story that’s gone before. And in this it shares a couple of problems that are common to many of the biblical adaptations. Firstly, most of the Christian characters are so goddamned upstanding they come across like brainwashed dullards, leaving it hard to have any kind of sympathy for them whatsoever. Secondly, as it goes on the story becomes increasingly bogged down with religiosity, robbing the film of any kind of drama in the later stages of the narrative. It’s a curious thing that whereas the peplums often started slowly – with the writers trying too hard to set up the situation for the action that would follow – the biblical films actually become more boring as the running time progresses. That said, it’s not badly made. There are a couple of vaguely interesting elements, such as the way in which the Romans are treated with a perhaps unsurprising degree of sympathy (it’s the local politicians and bandits who are the villains), and the production values are generally good. But none of that prevents it from being a remarkably dull film, a fact which isn’t helped by the rather stodgy cinematography and direction. Bragaglia was a respected filmmaker who was popular with producers, but from a contemporary perspective his films show little of the intelligence or life of the work of Cottafavi, Francisci or Freda, and his work seems a rather old fashioned for the time. Surprisingly, considering the general lack of flair he shows for action sequences, he’d go on to make several more productions in the peplum genre, most of which suffer from a similar stodginess and lack of visual flair. It also suffers from the fact that Yvonne De Carlo is dreadfully miscast. Ms De Carlo was a very beautiful woman, but by 1958 her career was on the wane and she was looking older than her 36 years. Perhaps realising she was onto a losing cause, she hams it up as much as possible, which only goes to make leading man Jorge Mistral appear all the more boring. Massimo Serato and Andrea Aureli are much more entertaining, doing much the same kind of despicable stuff they did in numerous similar productions.